Covergirl Outlast All-Day Color & Gloss (9.99) is a highly pigmented lip color that includes a lipgloss to add shine and moisture. These are a new Covergirl Spring 2017 pick and will likely become a permanent part of the brand’s core collection. They appear to be retake on the original Outlast All-Day Custom Lip Color but not a replacement for it. Covergirl Outlast All-Day Color & Gloss are a dual-ended lip color and lipgloss with two different shades featured on each side that have a sponge tip applicator for application per each shade. Each of the sides holds .1 oz of lip color and gloss. I was a little confused by this product my first few times using it. I thought maybe the gloss side acted to set the lip color side for all day wear. As most Outlast lip products were created with hours of wear in mind Turns out that’s not the case with this formula. The gloss is merely there to add a hint of shine but nothing more. To begin application you’ll start with the lip color side. The lip color is a thin, fluid-like texture that feels like a gloss and has the finish of one as well with a hint of shine once applied. It actually applies very smooth and even initially but it sets to a more semi-long wear within a minute or two. During that set you’ll notice the color separates a little bit and starts to fall into the natural lines on your lips which gives the finish an uneven finish and patchy look. The gloss comes in to save the day in my opinion as once applied on the color smooths out considerably for a more even look. 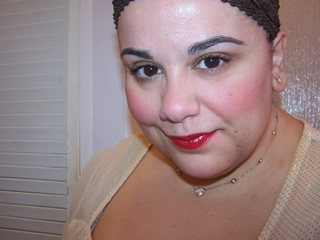 The lip color has fairly good pigmentation and the colors I tried were all very flattering shades. 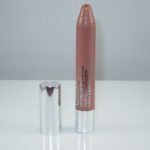 The application is easy and the product feels comfortably at first on my lips but the gloss is a necessary evil for the color to look it’s best. I felt compelled to apply and reapply the gloss several times during the wear because the gloss fades fast and the lip color under it wears long which results in the lip color looking patchy and drier as well as feeling drier on my lips. As soon as I applied the gloss my lips instantly felt better. It’s a shame that the lip color is so long wearing but the gloss is not. I see where they are going here with the lip color. They give an almost permanent-like set which results in a strong five hour or so wear but that wear is far from perfect if you aren’t chronically reapplying the gloss side of the duo. It’s a shame really because I was impressed with the wear and also with the light formula and easy application not to mention how flattering the colors were. The gloss side is a shade disappointing because not only does it wear for a short time but it also provides very little shine and some of the color combos are a bit odd. For example, I picked up the shade So Mauvelous which has a pretty rosy mauve lip color but Covergirl pairs it up with an oddball grape gloss shade. It’s a rather weird pairing. For sensitive users, these do have a cake-like fragrance and flavor that disappeared fairly quickly after application. Covergirl Outlast All-Day Color & Gloss might be an ok purchase if you find them on sale. I have admit the shade selection sways my review a little because some of these colors worked very, very well for me and when I pair them with a clear gloss of my own I love the results. However, the gloss they included and the formula of the lip color itself leaves a lot to be desired. I wish the lip color wore a little better and a little less dry. I also wish the gloss side wore strong as well and was a little thicker and shinier. Interesting idea that’s for sure and not a complete write off if you can find them on sale and you’re willing to doctor the formula a bit. Covergirl Outlast All-Day Color & Gloss are available at walgreens.com and amazon.com as well as at all mass drugstores. a sale and give one a try, but I have a feeling they won’t work for me. Colors look great — and it looks great on you! — but the application sounds way too finicky. I have the Ruby shade. It’s a very pretty color. However, it took industrial strength makeup remover to get it off my lips after 14 hrs. I usually wear the Outlast or Rimmell provacalips and know how to get those off with one Almaty eye makeup remover pad. But this required Clinique Take Off, baby oil, micellar waterproof, and I still had red tinges. It is a beautiful color and I will wear it on days I want serious red all day. I would recommend moisturizing around lips if you are dry because it can creep a bit if you have tiny lines. I have a soft spot for Outlast because that is the lipcolor I wore on my wedding day. (EverBerry) Way back in 2003 there were not a ton of longwearing lipsticks, Outlast was perfect for a full day of kissing, sipping champagne, etc. My lips looked great from start to finish. I might try the new formula if there is a good sale. I’ve tried 4-5 different incarnations of these over the last 10 years or so but they just never agree with me since I have really dry lips and the whole point for me is to not have to keep reapplying but you need to reapply the topcoat/gloss/balm, whichever the product comes with. It’s too bad because keeping lipstick looking fresh for 8 hrs through multiple bottles of water would be awesome. I think the only way to get through 8 to 10 hours is a matte long wear liquid lipstick but most formulas are so damn drying! That rich caramel shade looks fabulous but I hate lipsticks in general (had worse-than-Steve-Buscemi-teeth until a few years ago when I got braces but I’m still not keen on drawing attention to my mouth with makeup, probably will feel like that for life). I’m not a fan of full coverage lipcolor because teeth and then I end up looking like those old ladies. You know the ones. I will stick with chapsticks and tinted balms (though I own a L’oreal HIP lipstick in Royal an when I dab that one it gives me a deep flushed just-got-effed color so I do love that one), cause I’d rather expend my makeup energy on eye makeup than mouth makeup anyway. If I saw these on super sale or clearance though, I might try them, bc I really do like that caramel colored one. Are you able to apply these in a very sheer manner? Atop lip balm to help spread it thin? And. Did you try the glosses on their own? How was the pigmentation? The pigmentation on the gloss is really sheer and the formula is super thin so not a lot of shine. They are already actually quite thin all their own so no need to sheer them out any further with other mediums. The shades are thin and lightweight.